A”case study” in the context of marketing is an analysis of a project, campaign or company that identifies a situation, recommended solutions, implementation actions and identification of those factors that contributed to failure or success. Case study content can be multi-purposed in text, image, video and document types: web page, PDF, Word, PPT, Slideshare. 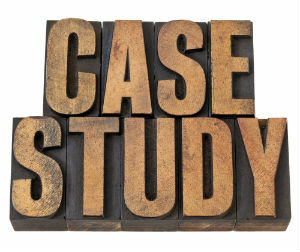 Case studies can serve a role in eBooks, white papers, guides & best practices, webinars and conference presentations. Boring or underwhelming performance cited in case studies can do a better job of turning prospects away than engaging them. Invest in great writing. “Most case studies are focused on the solution and how great it is to the exclusion of any real “story.” To be effective, case studies need that middle part where the magic happens. Case studies need a beginning, middle and end focused on the customer’s perspective – just like all other content. I advocate for two versions; a 1 pager with the facts for a quick read and a longer “story” version that helps prospects visualize themselves solving the problem.” Ardath Albee, CEO Marketing Interactions, Author. 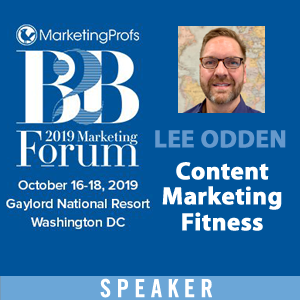 “Case studies can be a wonderful piece of a B2B marketer’s content marketing strategy except that most of these marketers make the mistake and use it to beat their chests like Tarzan. They have to remember: it isn’t about them, their product or their service. It’s about their customer, their problems and how they got solved.” Bryan Eisenberg, Best Selling Author, Keynote Speaker and Consultant. 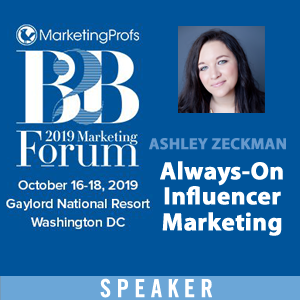 “Customer case studies in all formats are impactful for both B2B and B2C marketers as a way to tap into the significant power of peer-generated reviews and recommendations. My first choice is shorter, video formats b/c you can use photos, faces voice, movement to convey a proven, real third party endorsement.” Sandra Zoratti, VP Global Marketing at Ricoh, Author. Case studies are just stories. Too often these days, they’re presented in a formulaic manner, but when thought of as stories, they can be powerful. B2B marketers talk to each other. In fact, more B2B purchasers start their research online than B2C — with peers representing one of their most important resources. As long as it’s relevant and compelling, a story that conveys a solution to a problem in human terms should make for an effective piece of content. Shel Holtz, ABC, Principal of HC+T, Co-Host of For Immediate Release and Author. Case studies can be a remarkably effective content tool. They seem to be most commonly used deeper in the funnel as a “proof point” or “testimonial” for the B2B sale. But they can also be a great awareness builder and credibility builder for the brand as well. One of the biggest mistakes I see companies making is that B2B marketers assume that they must get a product endorsement in order for a case study to be effective. 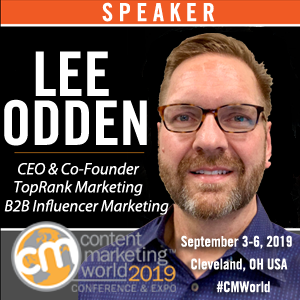 But I’ve found that a quality interview (or story) of a customer, that makes no mention of your product or service at all — yet highlights the client’s expertise or success — can be a remarkably successful content marketing approach. It’s often the most effective way to get a client that isn’t allowed to give an endorsement to actually speak. The sheer fact that their story appears on YOUR site is almost always all you need to generate value. 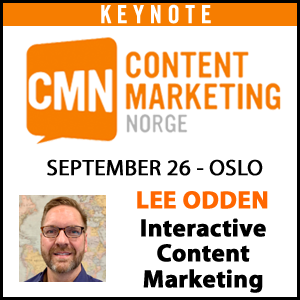 Robert Rose, Chief Strategist at Content Marketing Institute, Author. How Are Case Studies Used in B2B Content Marketing? When you search the phrase “case studies” plus terms that define your industry or situation, there are a wide variety of examples available. A good example is the Killer Content Awards deck embed in this post. Here are a few specific examples of companies successfully using case studies in their content marketing efforts. 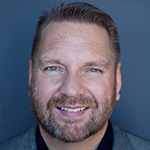 MarketingSherpa does a great job of providing details in each of their marketing case studies, which you can find in their Library of resources. 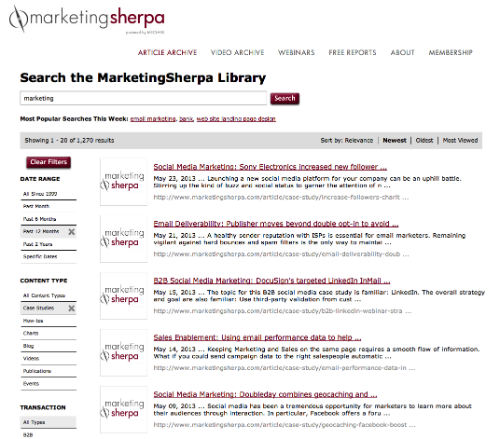 As a long time publisher of best practices, industry news and reports, expectations are high with MarketingSherpa. Just visit the Library section of their site and check the “case studies” filter in the left sidebar. Select any other refinements and you’ll get a list of case study articles. Each is written by a professional journalist and includes: Summary, Challenge, Campaign (with specific steps), Results and Creative Samples. The source is always cited as are related resources. What these case studies might lack in terms of visual fanfare, they more than make up for in terms of depth and insight. Google Think Insights site contains an impressive collection of resources including case studies. As you can imagine, the search function is impressive but there are also a variety of ways to filter based on: Industry, Marketing Objective, Ad Type, Technology, Audience, Region and Type of Content you want to view. Each case study follows a format of Goals, Approach, Results and may include a PDF download, creative assets or a video of the success story. Related case studies and content are also recommended. Obviously Google has substantial resources to create nearly 700 case studies, but there are lessons to be learned from the case study content and how users find that content. Navigation is based on user self segmentation vs. a simple link to “Case Studies”. 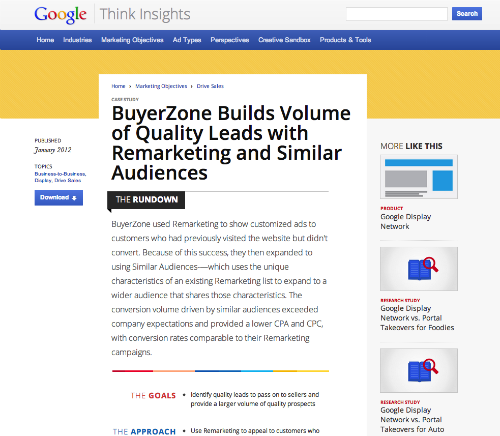 This approach gives Google some context to provide more relevant case study content. In terms of the case study content, the combination of summary, web page, PDF and video provides different users with format options to choose from. HubSpot is another example of a company that has collected a large number of customer stories and case studies. The previews for each case study include summary, bullets, a photo of of the customer with a testimonial, and clickable keyword tags. The actual case study pages vary quite a bit and do not follow a common template. But they do provide problem, solution, performance information. What HubSpot does really well is the ease of navigation, the summaries and calls to action. They are ready to do business. 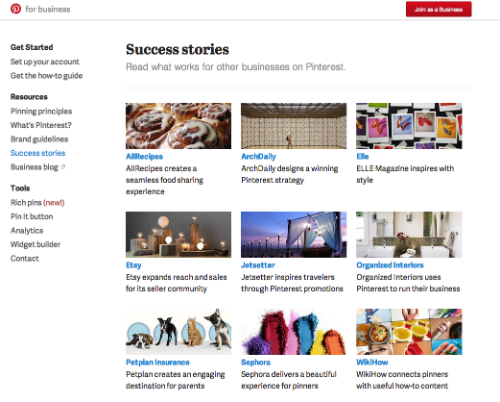 Pinterest, as you can imagine, provides a more visual experience with their success stories. There are just a handful of case studies, which is something I think a lot of mid market or new companies can relate to. When you don’t have hundreds of case studies, then be sure to make the most of what you’ve got. With so few case studies, there is no categorization but that’s something Pinterest will want to consider as they add more. Each case study page includes stated Goals, and an endorsement/photo from the client. Most importantly, tactics, implementation and results information is provided in a story format using conversational language. Headline: Who, What, & Results – 10 to 15 words. Visual: Skip the stock photos and opt for images of real people when appropriate. Company logos and screen shots of results/performance information are handy as are any compelling visual elements that complement the story. Challenge: Start with the current situation. What is the trouble? Create friction and a sense of urgency that this problem needs to be solved. Solution: How does solving this problem create a positive business impact? What role did your brand play in the solution? Offer justification for the recommendations through the approach and tactics. Results: Create points of comparison. Contrast “the trouble” with the solution. Provide KPIs & outcomes. Use raw data points, percentages and general quantifiables as appropriate. Results must be compelling, remarkable, impressive! Align those results with your brand and offer future direction. Include a quote or testimonial from the key person involved with the project. How did this help them and what has this success done for the business? Close it: Near or alongside the case study, include a call to action appropriate to the case study. Don’t leave the CTA to your website’s “contact us” link or button in the navigation. Media: In the B2B world, a PDF file is expected. Be sure to offer the case study as a web page and in PDF format at a minimum. But don’t overlook posting to services like Slideshare or repurposing for use in articles, reports, webinars or conference presentations. What’s your opinion on case studies? Are they tool uncool for B2B marketing school? If you’ve been successful with case studies, what’s your secret sauce? Thank you for providing a guideline for those key elements of a persuasive case study. I also agree that storytelling is what creates engaging connections prospective customers. This was awesome. Even though I have case studies for my business, articles written well, like this one, can always inspire. This post is so informative and is a great usefulness for marketer like me. Thanks for sharing the sources for good case studies and remind me of the oudated cases. Fantastic article that gets at the heart of the challenge: case studies should be about the success of the client and the value of your product or service should be implied in the methodology. This is amazing !! These case studies makes people think, analyze and finally helps in taking decision. Very inspiring article. I will share this ! !